Many historians will tell you that the French Indian Wars were nothing more than a continuation of the frontier fighting that had been occurring for more than 100 years. They refer to a series of wars that took place between 1689 and 1763. The French Indian Wars were fought between the French and the British on what would become colonial America. Native Americans fought for both sides, and against each other. They also fought against settlers in the Ohio Valley, and along the borders of Maryland, Virginia, and Pennsylvania. Warriors for the Seneca and Mohawk fought for the French, while Iroquois warriors fought for the British. The influx of British colonists who settled and exploited Native American lands was the major cause of the wars. As the new European settlers moved west, they drove the tribes from their lands and sources of food. At the time, the main objective of the war was keeping their lands free from Europeans. However, at the same time, the Native Americans wanted a trading partner, and as a result tribes lined up on both sides. The French Indian Wars started in a remote part of Pennsylvania in 1749. It started when a Miami Indian chief named Memeskia broke away form the French and moved south to Ohio where he could barter with traders. 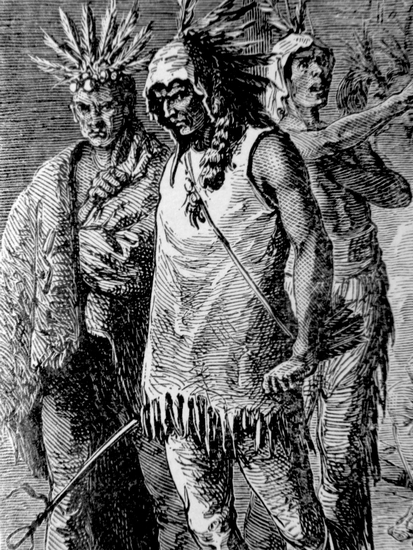 Everything was fine until four years later, Then on June 21,1753, a French Indian agent named Charles Langlade attacked the Miami town of Pickawillany (Ohio). which was a major British trading center. At this time, the French were in the process of constructing a series of forts between Lake Erie and the Ohio Valley. Finally, during the winter of 1753-4, the state of Virginia, with the encouragement of the British, dispatched a young George Washington to ask the French to leave. Also, Washington was told to protect the new British Fort Necessity at the forks of the Ohio River. He and about 150 troops were supported by both Seneca and Mingo warriors. However, when they arrived the fort, it had already been captured by the French. Soon after, Washington responded by ambushing a French reconnaissance force of 33 men, killing an officer and 9 soldiers. The French Canadian government didn't waste time responding. They went after Washington with an army of 900 men. The French, who greatly outnumbered Washington, overwhelmed his troops at Great Meadows, Pennsylvania, killing half of his men. Washington was forced to surrender on July 4, 1754. During the first few years of the wars the British took the bulk of the beatings. French and Canadian troops attacked Fort Bull in New York, leaving only a few survivors. Next, in 1756, 3,000 French and Indian troops attacked the British Fort Oswego, easily capturing it. Then in 1757, the British elected a new Prime Minister named William Pitt. Pitt was dedicated to winning the war. He dramatically increased spending and sent in an additional 2,000 troops. Before long, the British controlled French Quebec and they had resounding victories at Fort Niagara, Fort Ticonderosa, and Fort Louisbourg. The last major conflict was the Battle of Quebec, which the British also won. The peace treaty was signed in 1763.